With one week left until the summer movie season gets off to an early start, last weekend's top two films, Rampage and A Quiet Place, swapped spots this weekend. A Quiet Place returned to the top of the box office with $22 million, with Rampage nipping at its heels in second with $21 million, holding off newcomers I Feel Pretty and Super Troopers 2, both of which still performed quite well in their debut. Still, they could not take down A Quiet Place and Rampage, both of which posted impressive and minimal decreases to remain in the top 2. 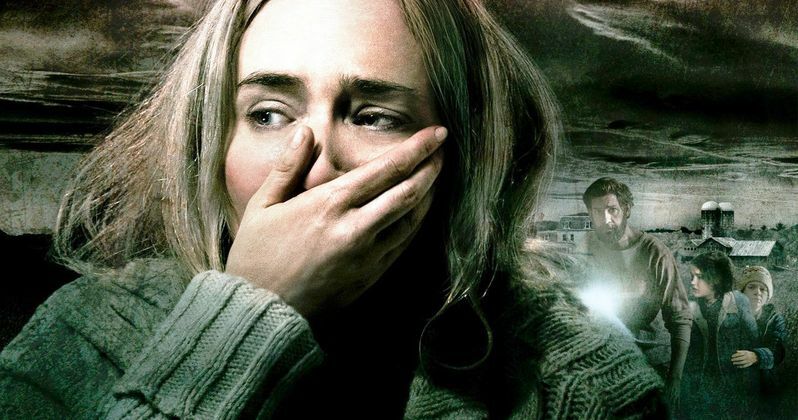 A Quiet Place had already put together an impressive run with its first two weekends combined, over-performing in a huge way with a $50.2 million opening and dropping just 34.3% in its second weekend with $32.9 million. We had posited that it would suffer a more "normal" drop in its third weekend, but it actually dropped just 33.3% in its third weekend with $22 million, with a $5,777 per-screen average from 3,808 theaters. This tally brings its domestic haul to $132.5 million, vaulting it past Ready Player One to become the second highest grossing movie of the year thus far, and a distant second place at that behind Black Panther ($681 million), but with a worldwide tally of $207.1 million, from a $17 million budget, it could just be one of the most profitable movies of the year. Since A Quiet Place and Rampage were so close together in the Sunday estimates, it's possible that the could switch spots when the actual figures debut tomorrow. Rampage dropped 41.3% in its second weekend, adding 14 theaters for a theater count of 4,115, pulling in a solid $5,113 per-screen average. This weekend's total brings Rampage's domestic haul to $66.6 million, but it's performing much better overseas, with a $216.4 million foreign tally to bring its worldwide total to $283 million, from a $120 million budget after just 10 days in theaters. While it should slide next weekend when Avengers: Infinity War hits theaters, it should still pull off a solid domestic and worldwide run. I Feel Pretty debuted in third place with $16.2 million, followed closely behind by Super Troopers 2 in fourth with $14.7 million, with Truth or Dare rounding out the top 5 with $7.9 million. I Feel Pretty debuted in 3,440 theaters with a middling per-screen average of $4,715, while Super Troopers 2 out-performed most projections, some of which were as low as $5 million, pulling in an impressive $7,213 per-screen average, opening in just 2,038 theaters. Both were produced under minimal budgets, with I Feel Pretty produced under a $32 million budget and Super Troopers under a $13.5 million budget, $4.6 million of which was raised through a successful IndieGogo campaign. The top 10 is rounded out by Ready Player One ($7.5 million), Blockers ($6.9 million), Black Panther ($4.6 million), Traffik ($3.8 million) and Isle of Dogs $3.4 million. Looking ahead to next weekend, Marvel brings its highly-anticipated Avengers: Infinity War, which has been projected to take in between $235 million and $255 million, and if it hits the high end of those projections, it will break the $247.9 million opening weekend record set in December 2015 by Star Wars: The Force Awakens. Take a look at the top 10 estimates for the weekend of April 20, courtesy of Box Office Mojo, and check back on Tuesday for next week's projections.